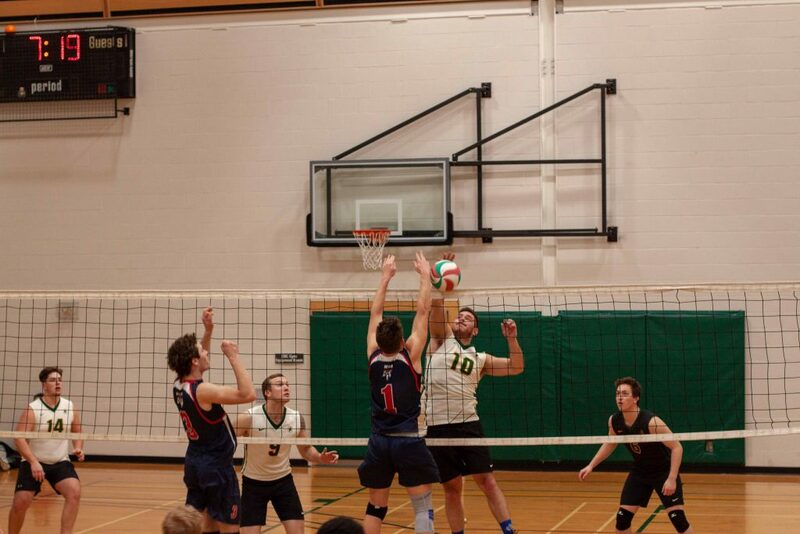 Fleming Knights men’s volleyball (3-7) played host to their invitational tournament this weekend, going an impressive 2-1 during the event. Earning wins over Loyalist (1-8) and Trent (1) (0-8), before losing a hotly contested match-up against George Brown (6-4), with the winner going to the tournament finals. Assistant coach Jordan Ross seemed optimistic about Fleming’s play, “We’re happy with our result in the tournament, we had a close game against George Brown but the main point of the tournament is getting your players ready after the Christmas break for the second half of the season.”. As playoffs approach Fleming seems poised to receive a playoff berth, currently sitting in 7th in the OCAA East, the last playoff spot, up 0.5 games on the Centennial Colts. “We’re hoping to make a strong push and try to get into the 5th or 6th spot. We’re going to try to work our way up the ranks as much as we can to try and get ourselves a more advantageous playoff match-up.” Ross said of his team’s expectations for 2nd semester. Trent (2) went on to take the tournament over George Brown by a score of 3-0 (25-22, 25-18, 25-22). 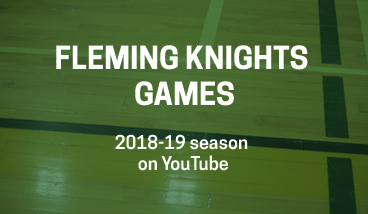 Fleming Knights men’s basketball to host the 2019 Knights Winter Classic, a fundraiser for the varsity basketball program, being held at the Peterborough Sport & Wellness Centre. 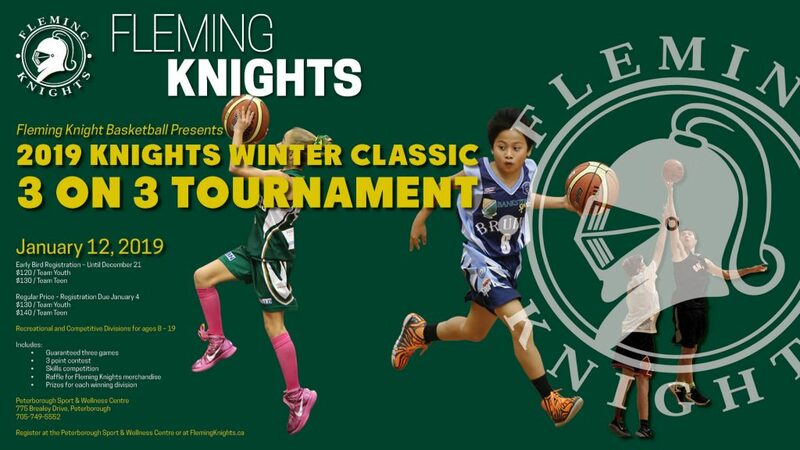 Peterborough, ON December 7, 2018 – Geared towards youth aged 8 through 19 years of age, the 2019 Knights Winter Classic basketball tournament will run on January 12 starting with 9 am sign-in at the Peterborough Sport & Wellness Centre. This tournament is open for both male and female youth and teens. This tournament will have a recreational and a competitive division separated into age categories and run by the Fleming Knights men’s basketball team and coaching staff. The recreational division will be divided into youth ages 8 – 9, 10 – 12, teens aged 13 – 15 and 16 – 19. The competitive division will be divided into ages 13 – 15 and 16 – 19. To register for the 2019 Knights Winter Classic visit the front desk at the Peterborough Sport & Wellness Centre, or online at http://flemingknights.ca/knights-winter-classic/. The tournament will also include a 3 point competition, skills competition, raffle for Fleming Knights merchandise, and prizes for winning teams in each division. 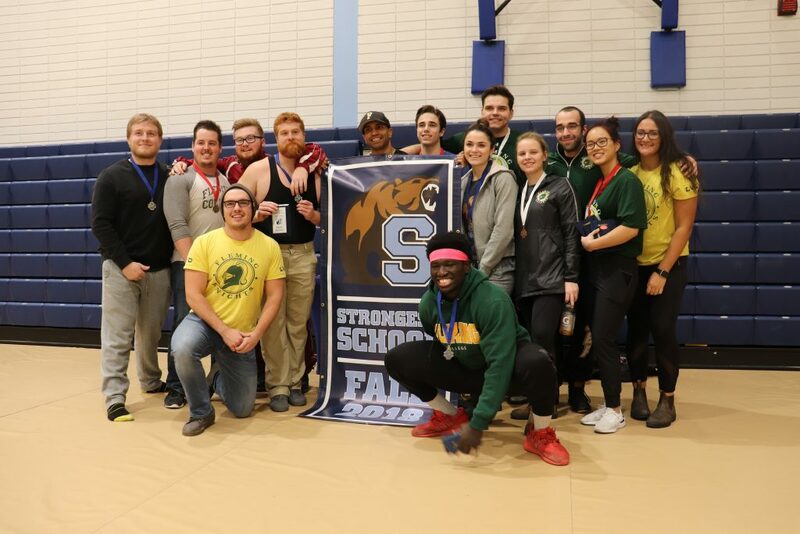 Fleming Knights extramural powerlifting team overwhelms the podium and earns the title of strongest school at their first competition of the 2018-19 season. Peterborough, ON November 30, 2018 – Following a highly successful competition at Sheridan College in Brampton on Sunday November 25, the Fleming Knights extramural powerlifting team celebrates their high success and recognition as a team and as individual lifter. The extramural powerlifting team is only in its second year at Fleming College. Despite being a relatively new sport for Fleming, the powerlifting team has and continues to rank high in competition. Last year the team was awarded Second Strongest Team motivating the team for further their training and obtain the title of Strongest Team at this past competition. With ten athletes representing Fleming, nine of those ten placed in the top three in their respective weight categories. Fleming was awarded male and female MVPs. Fleming’s men’s powerlifters were awarded Best Overall, Best Squat, Best Bench, and Best Deadlift. Likewise, Fleming’s women’s powerlifters were awarded Best Overall, Best Squat, and Best Deadlift. Fleming Knights women’s powerlifters dominated the women’s 63 kg category placing first, second, and third. Fleming Knights men’s powerlifters placed first in men’s 83 kg, first and second in men’s 93 kg, second and third in men’s 105 kg, and first and second in men’s 120 kg. 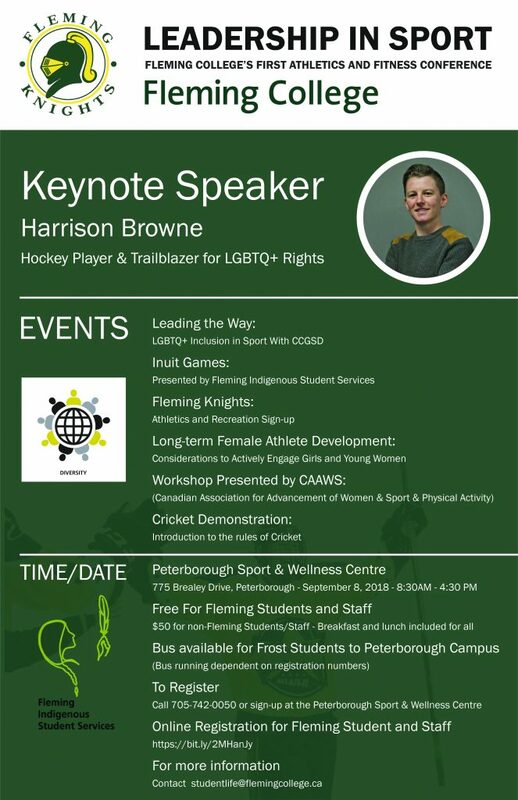 For additional details email sportsinfo@flemingcollege.ca. Congratulation Fleming Knights’ Loggersports teams for an excellent finish at your home competition! Fleming’s Women’s A placed 1st overall. First place was awarded for Quarter split, stand block chop and choker race. Second place was awarded for cross cut, single buck, pulp throw, and log decking. Third place was awarded for water boil, underhand chop, pole climb, and chain saw. Fleming’s Women’s B placed 7th overall and was awarded third place for log decking. Fleming’s Men’s A placed 3rd overall. First place was awarded for axe throw and pole climb. Second place was awarded for cross cut, swede saw, and log decking. Third place was awarded for underhand chop, and pulp throw. Fleming’s Men’s B placed 6th overall. First place was awarded for log decking. Third place was awarded for choker race. Congratulations on the exceptional finish! 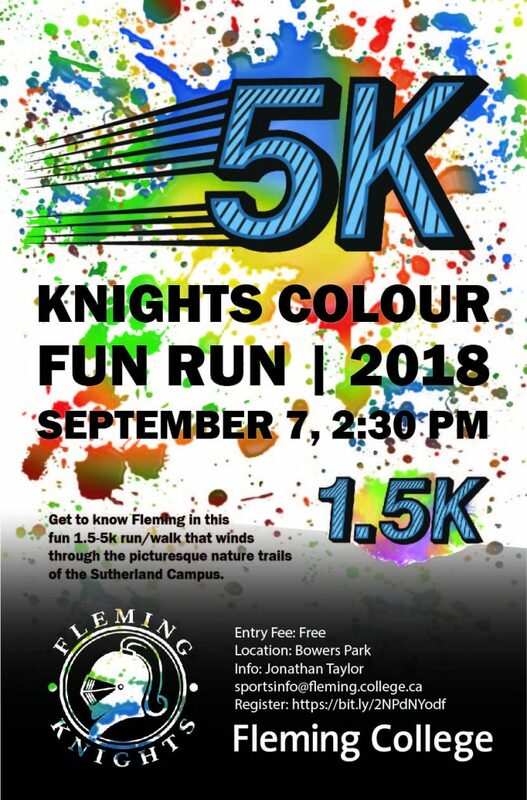 Join us on Friday Sepetmber 7, 2018 to celebrate the unveiling of Fleming College’s rainbow crosswalks while getting to know Fleming College’s beautiful campus in this fun and festive run/walk. Key locations on campus are showcased as well as our our extensive trail system that winds through picturesque natural areas. Donations to the student food bank are encouraged and can be dropped off at the fun run starting location. The run will start at the baseball diamonds near the Peterborough Sports & Wellness Centre. This is a free event and all are welcome. There will be a 5 km and a 1.5 km route with pizza and prices to follow the run. The race starts at 2:30 pm. The Fleming Knights Loggersports’ Women’s One team took second place at the McGill University Competition (January 2018), and at the Dalhousie University (February 2018). 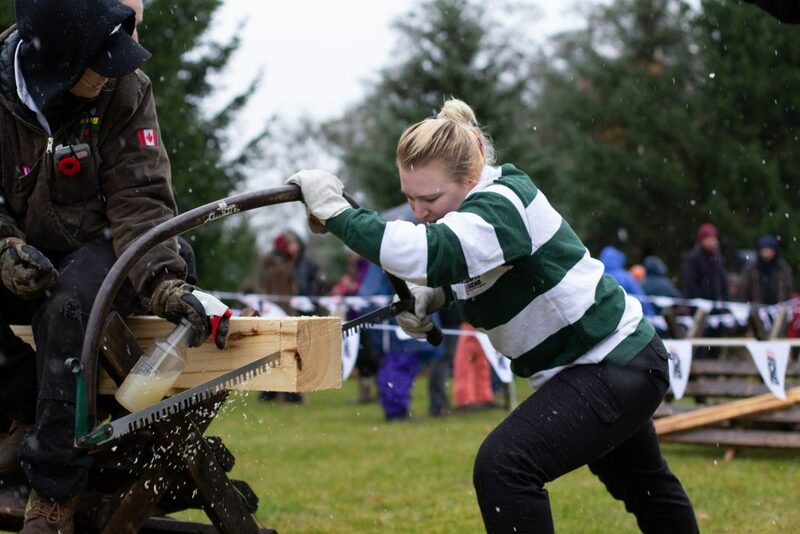 The Fleming Knights Women’s One Loggersports team was a force to be reckoned with this past winter placing in a number of events and overall taking second place at both competitions in this second half of their season. The Fleming Knights Women’s One Loggersports team has six team members, each competing in their own individual event, and share one paired event with one other person on their team. On the Knights Women’s One team was team captain Madison Tosswill (St. Thomas, ON), Nadine Perron (North Bay, ON), Elisha Jones (Neyaashiinigmiing, ON), Naomi Jones (Neyaashiinigmiing, ON), Taylor Bjerno (Mississauga, ON), and Hayley Cowls (Toronto, ON). 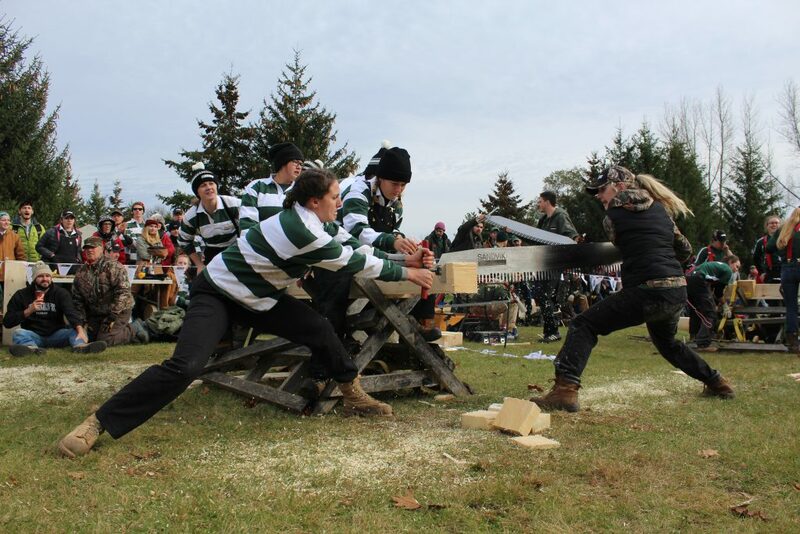 Competition highlights for Knights Women’s One Loggersports team from the McGill University include 1st place in axe throwing, log decking, and pole climb. Second place was earned in pulp throw, and snow shoe. Third place was earned in water boil, single buck, and standing block chop. 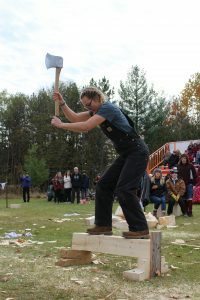 Highlights for the Knights women’s one Loggersports team from the Dalhousie University competition include first place in chain saw, standing block chop, and quarter split; second place in super swede saw, and pole climb; third place in underhand chop, axe throw, water boil, and single buck. The Loggersports season consisted of four competitions, two taking place in the fall, and two taking place in the winter. 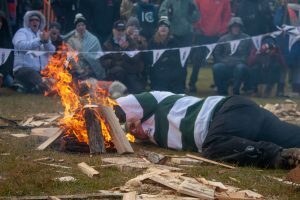 At each competition the Fleming Loggersports men’s and women’s teams faced off against other institutions competing in four team events, three partnered events, six individual events, and one individual pool event. 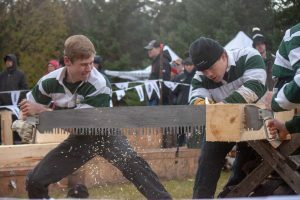 The Fleming Knights Loggersports team is one of two college institutions competing in the Canadian Intercollegiate Lumberjacking Association (CILA), along with four universities. Each institution may have up to five competing teams. 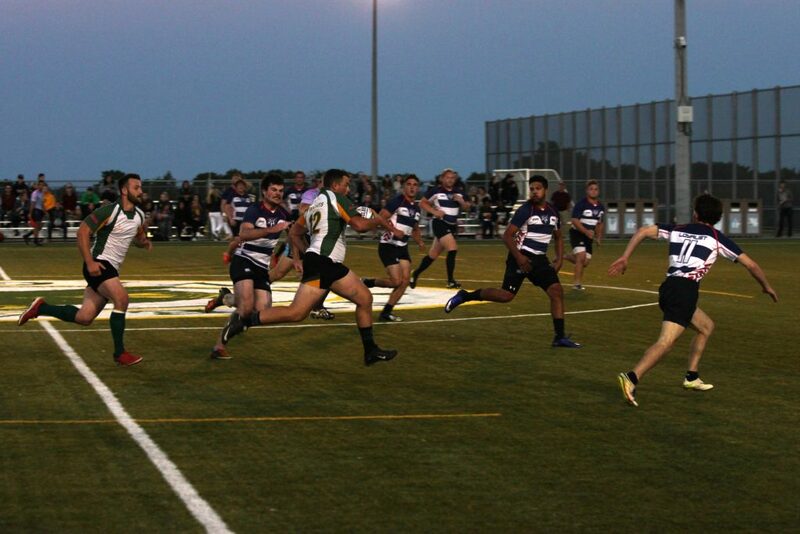 Each year Fleming College competes against other schools such as Algonquin College, Dalhousie University, McGill University, Maritime College of Forest Technology, and University of New Brunswick. The women’s Loggersports team was not the only team to encounter success. 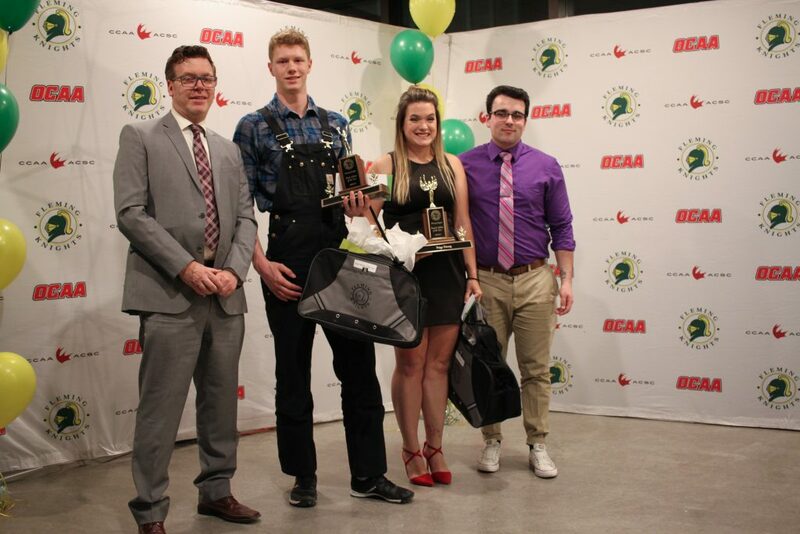 Fleming Knights Men’s Loggersports team had success early on in the season when they placed third at Fleming College’s home competition on November 4, 2017. After participating in the OCAA Curling Championships at Sault College in Sault Ste. 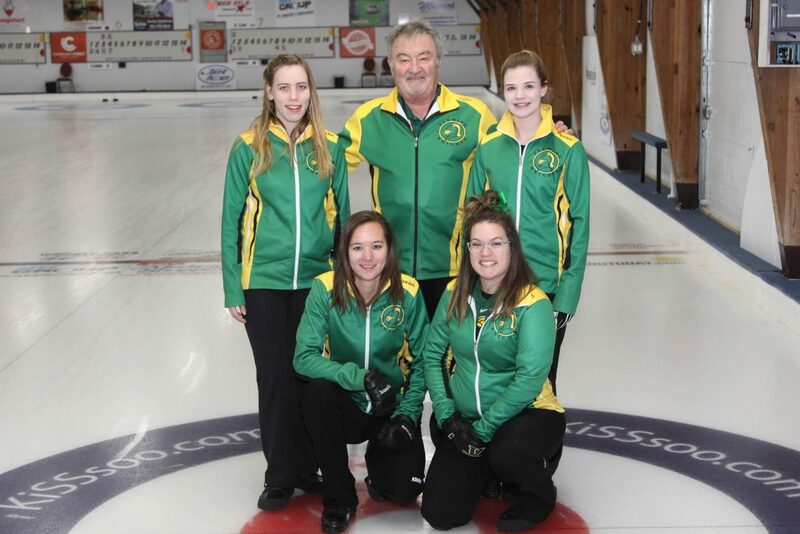 Marie Ontario, the Fleming Knights Women’s Curling team was crowned bronze, and qualified for Nationals. In the semifinals, Fleming took a strong lead against Fanshawe scoring five in the first three ends. Fanshawe stormed back in the fourth and fifth end and took the win. Fleming then moved on to face Humber in the bronze medal finals. In the bronze medal match, Fleming took the lead against Humber. Humber battled hard; however, in the end Fleming was victorious with a final score of 7-6. 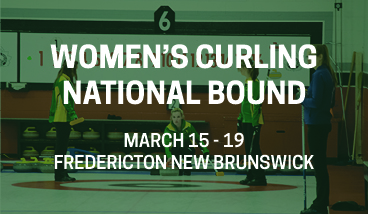 The Fleming Knights Women’s Curling team looks ahead to the CCAA Curling Championships, which are set for March 21 – 29 in Leduc, Alberta, where they will face off against the top curling teams from across the country. At the OCAA Provincial Curling Championships, women’s coach Dave Farnell was awarded OCAA Coach of the Year for the women’s team. 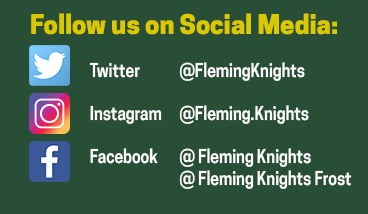 The Fleming Knights were awarded the Vern Dow Fair Play Award and the Hap Holman Fair Play Award. OCAA Championship Women’s Second-Team All-Star goes to Fleming Knights’ Skip Paige Droog. OCAA Championship Mixed All-Star goes to Fleming Knights’ Amy Conley.